What Should NASCAR Do with the Rules Package for the All Star Race? NASCAR’s All-Star Race was once a race purely built on money, star power and sometimes wacky race formats. Lately, it has been used as a de facto test session for rules packages, adding an element of intrigue to a race that has struggled to maintain the level of hype and excitement it once drew. 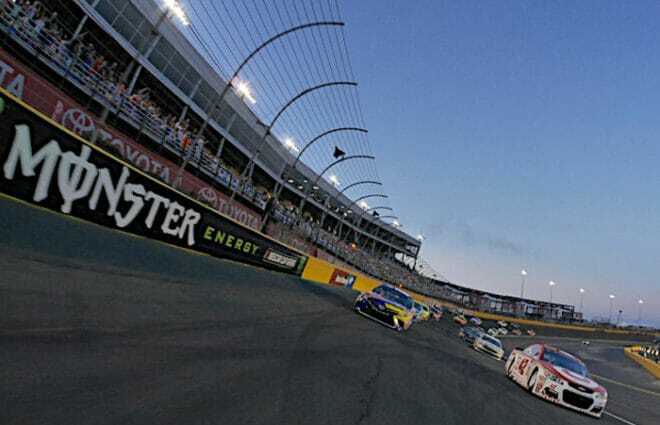 With the 2019 edition of the All-Star Race coming up in the next month, in a season where the storyline has been the new rules package, what should NASCAR do? Should it leave the package as is for an exhibition race or change it up and once again try an experiment in a race with virtually no consequences? Is high horsepower, low downforce something that could be utilized or should the All-Star package be more like 2018 with about 450 HP and high downforce? Speaking of the 2019 season, we are almost a third of the way through the schedule, and this is the point in the year where we start to pick out the surprises and disappointments. One driver who might fall into the disappointments category is Daniel Hemric, a driver that many had high hopes for going into the season but has seen his share of bad luck. The rookie driver only has three top-20 finishes, even though there were many who predicted he would have a great year in his first season with Richard Childress Racing. Will he get going or will he continue to have these disappointing runs? Can he find a way to consistently finish in the top 10 to 15, like Austin Dillon? Is the learning curve steeper than we thought? A: Last year used a similar package to what’s being run this season and frankly, it was an amazing race to watch. It was probably the best All-Star Race in many years. Little did we know at the time that NASCAR would consider using something like it this entire 2019 season, especially since many said they would like to see it only for exhibition races and nothing else. That, of course, leads to what I would like to see this season. It’s highly unlikely that NASCAR will do this but I’d love for them to add horsepower back to the engines like they had in 2014 and before, and then take a few inches off of the spoiler. We know NASCAR has no problem experimenting when it comes to this race, though we’ve seen this done with more long-term implications in the past few years. It started when a package with lower downforce and less side force was used in 2016. This was followed by the use of tire options in the 2017 All-Star Race, and last season included a version of the package that the series is currently using. The Monster Energy NASCAR Cup Series is nine races into the 2019 season and I have seen my fair share of opinions on the current package. There are those who are currently not pleased with the current product, but I haven’t thought it has been that bad other than maybe one or two races. However, I would love for NASCAR to continue to experiment in next month’s All-Star Race. If we go back to 2009, double-file restarts were a huge topic of conversation because the All-Star Race was the only race at the time to use them and the results were, unsurprisingly, dramatic. Two weeks later, they were put into place permanently. The All-Star Race has waned in popularity over the years and changing up the rules a bit could lure viewers back in. It wouldn’t be surprising to see NASCAR shake up the rules package, or some other aspect of that race, with the intention of making it a more regular part of the series, if successful. A: I know he is only a rookie but Daniel Hemric has disappointed me a bit in this early portion of 2019. He currently sits 28th in the standings with only 97 points total in nine races. Going into this year, there were many people, including myself, who thought Hemric was going to have a big season. When I say big, I mean playoff contention and maybe stealing a win for Richard Childress Racing. Ever since his run at Atlanta, where he was fourth until a cut tire with about 30 laps to go, he has not had the best luck at all. He has a total of five laps led on the season and not a single top-15 finish. His best finish so far is an 18th-place run at ISM Raceway. While his results have not been great, he has two top 10 starts, with a best start of fifth in Las Vegas. Hemric’s teammate Austin Dillon has run extremely well this season, including this past weekend where he scored a sixth-place finish at Richmond. Hemric was 19th, his second-best run of the year. Dillon has had significantly better races than Hemric has, which leads us to wonder why Hemric has not had the same success after all the anticipation coming into 2019. Though he never won a race in the NASCAR Gander Outdoor Truck or Xfinity series, he came close on many occasions and was a routine top-five contender. Many believed that would change at NASCAR’s top level and that his talent would earn him a trip to the winner’s circle. Childress has two good drivers in their stable with Dillon and Hemric, and eventually, Hemric will find his way into the top 10-15 consistently as Dillon has been. There may be a steeper learning curve than originally anticipated, and it may take a few visits to these tracks in the Cup cars for him to put together a good, full race. Right now, it seems like a stretch for him to get into the playoffs, but he could score a few good finishes along the way and maybe grab a late regular-season victory to make it into the postseason. I expect his season will improve as the latter part of the year rolls around. Though he has had a rocky start, he should be able to finish in the top 20 in points by the end of the year and a Rookie of the Year season is still within reach.